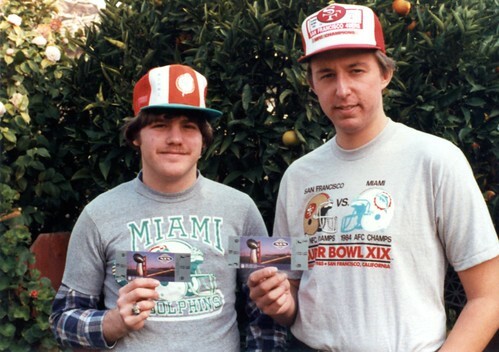 Eric and Aldo at Super Bowl XIX, originally uploaded by darsys. OK, so until a couple weeks ago, I didn't understand football at all. I didn't understand the mechanics of the game and never really understood why people get so fanatical about it. But I recently moved to Providence (home of the Patriots) from New York, my home town and a city I love dearly, and I now realize that it's really just about pride. It's totally silly and pretty meaningless in the scheme of things, but I was proud to be a Giants fan last night (even when they were down a bunch of points with only minutes to go) and it's mostly because I'm proud to be from New York. Really kind of silly. So I'm basically a sucker for anthropomorphic animation, and now football as well. Go Giants! While Michael Vick is serving a 23-month sentence in federal prison for his abuse and torture of the dogs of Bad Newz Kennels, 47 of the surviving pit bulls now have a chance to perhaps become dogs again. Most have a long road to recovery. 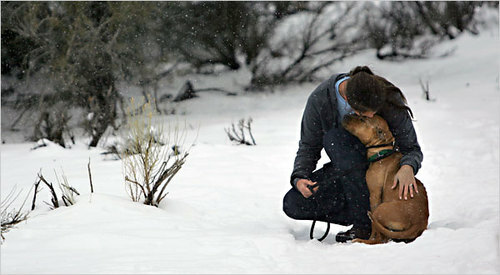 Georgia, for example, had all 42 of her teeth pulled so she didn't fight back when she was forced to breed. It's hard to know how to wade through all the discussions regarding race and Vick's conviction. Was he made an example of? Definitely. Was it because he was a football star? Probably. Would the reaction have been the same if he was a white football star? I don't know. One of the major points raised by Boyce Watkins, in his comments on the Vick conviction, is that the public was outraged over the abuse of these dogs while other (white?) folks serve lesser sentences for worse crimes. And that the horrors in Darfur continue while most Americans haven't a clue what's happening there. I wholeheartedly agree with him on both of these points. This conviction is just only if we convict people appropriately for their crimes, regardless of race or fame. What I very much disagree with Boyce on here is that what Michael did is akin to hunting. When you hunt a deer, you shoot them, and they die pretty soon after that. The deer is not tortured mentally and physically again and again for years on end or brutally killed by slamming his head against concrete when no longer needed. Boyce also thinks we should give Vick a break because everyone does "stupid things" when they are "young" at 28. This is absurd. It doesn't matter how young you are; if you dig out your dog's 42 teeth, you are a disgusting pig. And I think Boyce does a disservice to the youth of today by excusing this behavior.